The outstanding three-year-old miler Kingman was named the Cartier Horse of the Year at the 24th annual Cartier Racing Awards, European horseracing's equivalent of the Oscars. The Cartier Racing Awards were presented before an invited audience of 315 at the Dorchester Hotel, London, England. 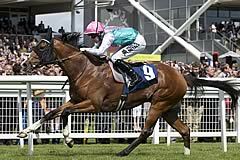 Owned and bred by Prince Khalid Abdullah, trained by John Gosden and ridden on all but one of his starts by James Doyle, Kingman won seven of his eight races with the final four coming in great style at Group One level. The son of Invincible Spirit beat his own generation with stunning victories in the Tattersalls Irish 2,000 Guineas at the Curragh in May and St James's Palace Stakes at Royal Ascot in June before proving his superiority over the older generation with equally impressive successes in Goodwood's QIPCO Sussex Stakes in July and the Prix du Haras de Fresnay-le-Buffard - Jacques le Marois at Deauville in August. In the Cartier Horse of the Year category, Kingman triumphed over formidable opposition - last year's winner Treve, who returned to her best with a breathtaking second Qatar Prix de l'Arc de Triomphe victory, dual Derby winner Australia and Noble Mission, Frankel's brother, who recorded a third Group One triumph of 2014 in the QIPCO Champion Stakes at Ascot on QIPCO British Champions Day. Kingman also takes the honours decisively in the Cartier Three-Year-Old Colt category ahead of Australia, The Grey Gatsby and Charm Spirit. Noble Mission gains some compensation as he scoops the honours in the Cartier Older Horse division after a close battle with Treve. The five-year-old, also owned and bred by Khalid Abdullah, really blossomed during 2014 and was expertly placed by trainer Lady Jane Cecil and ridden by James Doyle to take Group One events in Ireland and France before providing the most emotional moment of the season when revelling in heavy ground at Ascot to win a thrilling QIPCO Champion Stakes, emulating the victory in the race back in 2012 of his older brother Frankel, the unbeaten star, who was trained by Lady Cecil's late husband, Sir Henry Cecil. Also nominated for the Cartier Older Horse honours were the 2011 Cartier Older Horse Award winner Cirrus Des Aigles and Integral. 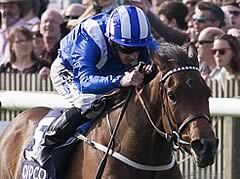 Taghrooda, bred and owned by Hamdan Al Maktoum, trained by John Gosden and ridden by Paul Hanagan, is the Cartier Three-Year-Old Filly for 2014. Successful on her only start as a juvenile, the daughter of Sea The Stars quickly established herself as a filly of rare quality. She landed the Investec Oaks at Epsom Downs on only her third start and then became the first filly since Pawneese in 1976 to follow up on that Classic win by taking Ascot's midsummer highlight, the King George VI & Queen Elizabeth Stakes sponsored by QIPCO. 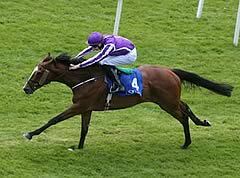 The other nominees in the Cartier Three-Year-Old Filly category were Avenir Certain, Miss France and Tapestry. Europe's top sprints in 2014 were dominated by a pair of horses owned by the Power family and trained in Ireland by Edward Lynam - Sole Power and Slade Power. 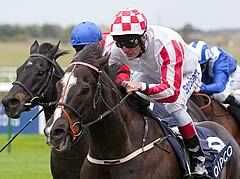 Sole Power just gets the nod over his stablemate in the Cartier Sprinter division, following a second consecutive victory in the King's Stand Stakes at Royal Ascot plus success in York's Coolmore Nunthorpe Stakes, another Group One over five furlongs which he was also landing for the second time, having triumphed in 2010. Slade Power's two Group One triumphs were the Diamond Jubilee Stakes at Royal Ascot and Newmarket's Darley July Cup, both over six furlongs. 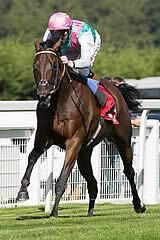 The two other nominees in the Cartier Sprinter category were Gordon Lord Byron and G Force. At the other end of the stamina spectrum, Leading Light, trained by Aidan O'Brien and ridden by Joseph O'Brien for a Coolmore syndicate, is crowned Cartier Stayer for 2014 after a close fight with Brown Panther, part-owned by Michael Owen and trained by Tom Dascombe. A Classic winner in the 2013 Ladbrokes St Leger at Doncaster, the four-year-old progressed to win Europe's stayers' highlight - the Gold Cup at Royal Ascot in June, when he defeated the 2013 winner, The Queen's Estimate. The Tom Dascombe-trained Brown Panther was the runaway winner of the Palmerston House Estate Irish St Leger under Richard Kingscote. Another Ladbrokes St Leger victor Kingston Hill and Emirates Melbourne Cup scorer Protectionist were the remaining nominees in the Cartier Stayer category. 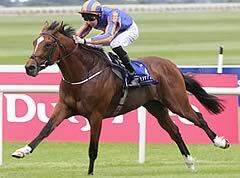 Coolmore and both O'Briens also enjoy success in the Cartier Two-Year-Old Colt category with Gleneagles. The Galileo colt won four races in Ireland headlined by the Group One Goffs Vincent O'Brien National Stakes at the new Irish Champions Weekend in September before being demoted when first past the post in the Group One Qatar Prix Jean-Luc Lagardere at Longchamp. Ivawood, The Wow Signal and Elm Park were the other nominees for this award. Tiggy Wiggy proved herself a prodigious talent this season, winning on five of her seven outings, culminating in the Group One Connolly's Red Mills Cheveley Park Stakes at Newmarket and she is the 2014 Cartier Two-Year-Old Filly. The Richard Hannon-trained filly saw off opposition from Cursory Glance, Found and Together Forever. The Cartier/Daily Telegraph Award of Merit in 2014 goes to Sheikh Hamdan Al Maktoum. Since owning his first European winner in 1980, Sheikh Hamdan has established himself as one of the leading owners and breeders of the 20th and 21st centuries. His phenomenal success spans the globe with victories at the highest level in Europe, Dubai, North America and Australia. A fabulous 2014 saw him win a 12th British Classic with Taghrooda in the Investec Oaks. Harry Herbert, Cartier's Racing Consultant, commented: "2014 was another exceptionally strong year for quality Flat racing in Europe and horses trained here did well the world over. "Kingman is an excellent winner of the Cartier Horse Of The Year Award and overcame stiff opposition from Treve, Australia and Noble Mission. He was also successful in the Cartier Three-Year-Old Colt category. "I wish to congratulate his connections and those of Noble Mission, Taghrooda, Sole Power, Leading Light, Gleneagles and Tiggy Wiggy for being Cartier Racing Award winners too. "Sheikh Hamdan bin Rashid Al Maktoum has been rewarded this year for his long-term investment in bloodstock and I am thrilled the Cartier Jury gave him the Cartier/Daily Telegraph Award Of Merit."